Welcome Station is the first-ever service upselling kiosk for the automotive repair industry. It helps to ensure accuracy of information for both new and returning customers with the quick and seamless self-entry of customer and vehicle data. After all, who better than your customers to fill out their correct home address, telephone number, email address, and vehicle-specific information? Besides updating any out-of-date information, customers can add new vehicles to their account, review and add pending service recommendations, and consider adding additional services and canned jobs to their order. Your shop can eliminate long lines during the morning and afternoon rushes, all while saving minutes per customer and adding to your bottom line. With a few taps, customers can check themselves in and speed up your shop’s daily process. Based on a modest 2 minutes-per-customer savings, shops with an average daily car count of 15 vehicles could save 2.5 hours per week; just in customer check-in time! Those extra hours are possible without adding staff, or increasing workloads. In fact, Welcome Station will make your front staff’s work life easier. Is your shop looking for some help upselling air-conditioning services, wiper blade replacements, new tires, and more? Welcome Station incorporates weather alerts and climate-based service suggestions. 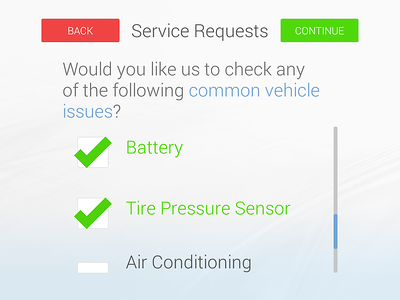 The addition of area-specific weather alerts further simplifies upselling the process by suggesting services based on the vehicle care needed to maintain safety in different climates. It’s raining – Would you like us to check your wipers? 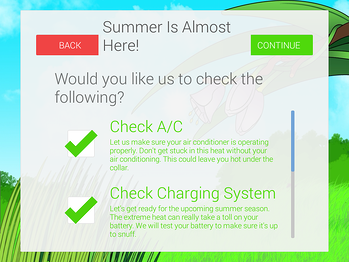 It’s been over 90 degrees lately – Would you like us to check your air-conditioning? It’s been less than 32 degrees lately – Would you like us to check your battery? Winter is coming soon. Would you like us to check your tires? All fully customizable by your shop. Since Welcome Station is fully integrated with leading shop management systems, customer-entered data automatically transfers to and from your current shop management software, eliminating mistakes and the need for staff to re-enter information. All information that customers enter into the kiosk is immediately synced with your shop management system. Upon checking-in, the kiosk reminds customers of past service recommendations and gives the ability to select them, as well as new services and canned jobs. 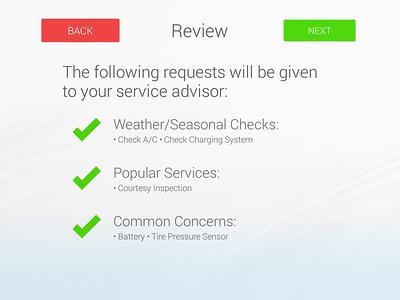 These service suggestions are shared with customers, without the need for service advisors to relay the recommendations, further speeding up the customer write up. Reminders and upselling have been proven to increase shop revenue. With Welcome Station, it can happen right in your shop while your staff focuses on other customers. Electronic signatures are common in grocery stores, frequently used for FedEx deliveries, and are growing in popularity at restaurant chains and other digital signature platforms. 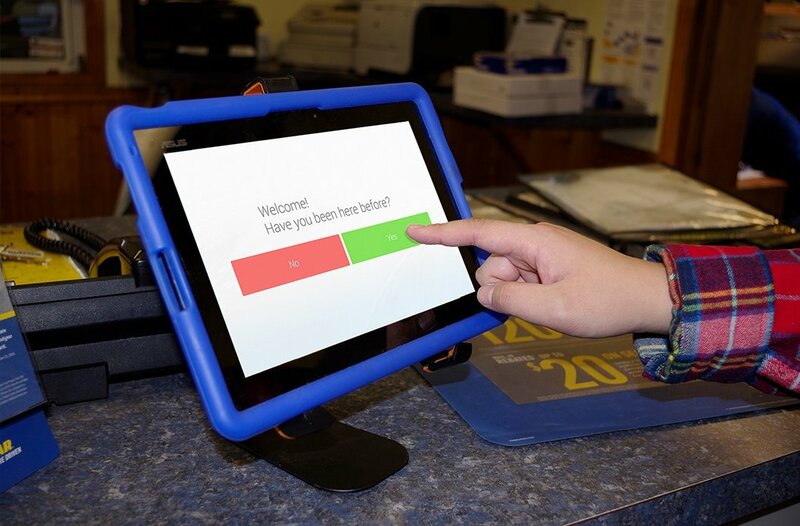 Now, auto repair shop customers can use the Welcome Station Kiosk to digitally sign and authorize auto repair services. Some customers would rather just get in and out of your shop as fast as possible. Welcome Station gives these customers a chance to take matters in their own hands. The Kiosk lets them enter their information and make their own choices with recommendation reminders and upsells. Empowering them to make their own decisions results in more upselling. *For more on the benefits of Welcome Station, visit Request a Live Demo or call 610-400-1019 (press 2).